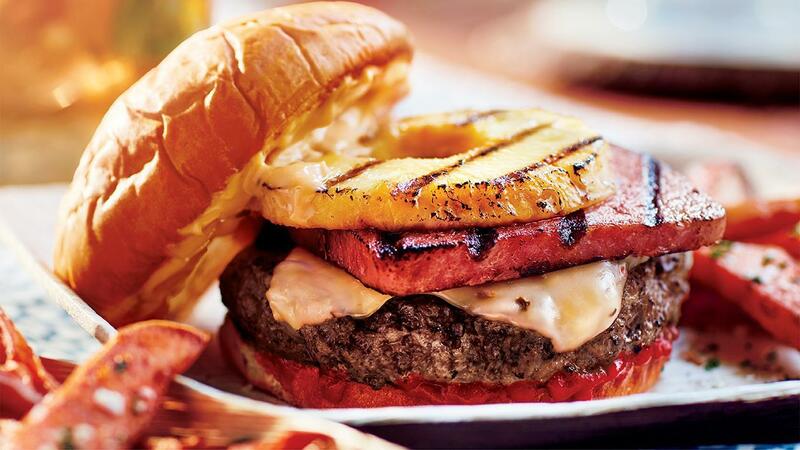 This burger consists of a ground beef and lamb patty blend topped with pepper jack cheese, beef bacon and pineapple. A sweet and spicy Hawaiian sauce made with Best Food Real Mayonnaise brings it all together. Try out the full recipe below! Combine honey, pineapple juice, teriyaki sauce, vinegar, sriracha sauce & sesame oil. Reduce mixture slowly by halve. Refrigerate & mix with mayo once cold. Combine ground beef and Lamb and form into 10 patties of 180g each. Cook patties to desired doneness and top with cheese. Sliced the pressed canned beef bacon product into 50g pieces. Grill them and season. Same for the pineapple slices. Build burgers by first spreading Hawaiian sauce on the toasted buns then the meat patty with its melted cheese. Top off with grilled canned meat, pineapple and more sauce.